If you are a registered user you can add four types of pages to guitar-list.com. Unregistered users can also add My-guitar-gear pages. If you are adding any of the above three pages, check they don't already exist. If they do you can edit the existing pages. 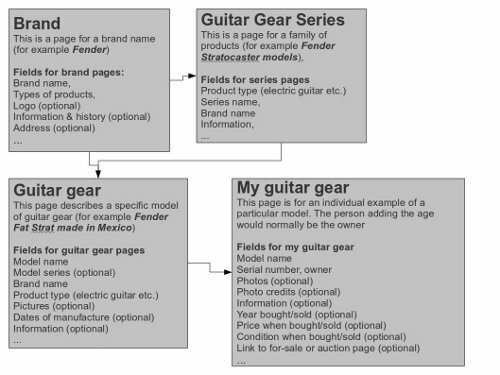 My guitar gear: is for an individual example of a partcular model. To add one of these go to http://www.guitar-list.com/node/add/content-my-guitar-gear. You can add your own guitars etc here. Please comment in the Forum if you have any ideas or suggestions to improve the way the site is organised.